The MFC-7440N is ideal for any desktop or small office. It can virtually fit in any workspace due to its compact, space-saving design. In addition to its crisp, razor-sharp printing, it can also be used to make a quick copy or send/receive faxes without the use of a computer. Enjoy the convenience of having a high-quality color scanner, too. Scan multiple pages using the 35-page auto document feeder or use the document glass for scanning a single document. Its advanced capabilities allow you to scan documents to a file, image, OCR, e-mail or to an FTP site - all with a touch of a button! 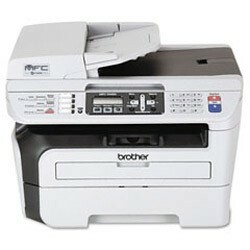 Plus, with its built-in Ethernet network interface you can easily share the MFC-7440N with others in your office too. Fast printing and copying. Print and copy speeds of up to 23 pages per minute. High-quality laser output. Produce crisp, rich black output up to 2400 x 600 dpi print resolution at a low cost per page that laser technology provides you. 35-page auto document feeder. A quick and easy way to copy, fax or scan multi-page documents. Flexible paper handing. Features a 250-sheet capacity paper tray adjustable for letter or legal size paper. Plus, a single-sheet manual bypass for envelopes, labels or other types of media. Flatbed color scanning. Use the document glass to scan pages directly to your e-mail application or to a single PDF file using the ADF. Fold-out rear output tray. Allows for a straight-through paper path and ideal when using the single-sheet bypass slot for printing envelopes or thicker media. 32 MB standard memory. Stores up to 500 pages in memory for faxing and can handle multiple print jobs and copying. 32 MB standard memory. Stores up to 500 pages‡ in memory for faxing and can handle multiple print jobs and copying. USB and Ethernet interfaces. Connect the MFC via USB to your computer or install it on a network for multiple users to share printing, scanning and faxing.